Join the Shane Gang in Slugterra: Ghoul from Beyond, the first feature-length Slugterra adventure! Based on the hit animated television series, Slugterra: Ghoul from Beyond continues the epic sci-fi comedy adventures set deep underground, where the ammo’s alive and only the quick survive! In this luminous, high-tech, underground world, every cavern holds a new adventure, a new battle and weird little slugs to be discovered. Just when the evil Dr. Blakk has been defeated and it seems like Eli Shane’s duties as protector of Slugterra are getting easier, a new danger emerges from beyond the 99 caverns. Eli and the Shane Gang rush to the rescue, but nothing can prepare them for what they encounter: a slug that can do something no one in Slugterra has ever seen — or heard — a slug do before! Traditional slugslinging no longer applies. Eli will have to engage in a very different kind of duel to save Slugterra…and himself! 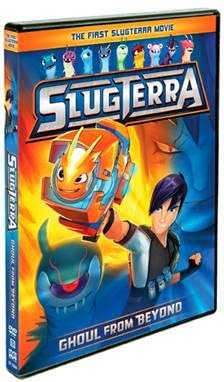 My kids have become huge fans of the show Slugterra over the last couple of years. It's definitely a show that interests both my son and daughter and reminds me of Pokemon. It's perfect because it's also a show where they both can enjoy with one another without the sibling arguing. With Ghoul from Beyond being the first full length movie of Slugterra, my kids were able to enjoy their favorite characters along with some new characters for a long period of time and enjoy some popcorn too. If your kids are fans of this show, I'd definitely recommend watching Ghoul From Beyond as it's a new adventure that all kids of all ages can enjoy! Disclosure: All opinions are my own. I received Ghoul from Beyond on DVD at no cost for the purpose of this review. No other compensation was received.